In this section we shall look at the changes in trajectory that occur in a number of ball games and sports. In many ball games, such as ping-pong, tennis or football, among others, the ball executes unusual trajectories, given that when it receives an impulse it does not travel on a straight line as would be compliant with the principles of dynamics, but instead veers away on a new, curved path that is apparently inexplicable, at least by the Classical Mechanics dynamics hypotheses. This effect is appreciated in many games and sports, whenever the ball is thrown or launched with intrinsic rotation. Under this assumption, if the ball has intrinsic angular momentum it is capable of following a curvilinear trajectory (See figure 11.17). If the ball has no rotation, on receiving an impulse it will be projected according to the classical mechanics of collisions, following a straight trajectory. 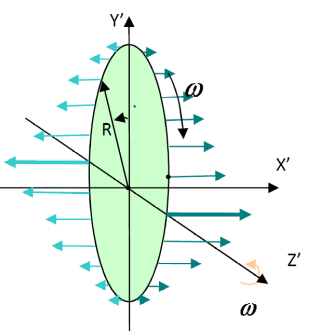 However, if it carries intrinsic rotation and it receives an impulse that gives it a new non-coaxial rotation, obeying the second law proposed a dynamic interaction will come into play through the coupling of the velocity field generated by the new rotation and the translation velocity field, and the ball’s centre of mass will modify its trajectory. This deviation will remain as long as the non-coaxial rotation received with the launching impact is maintained. On account of their magnitude, we cannot accept that these deviations are due to the Magnus effect, as expressed above in section 11.0.1, or to other aerodynamic effects as some authors have attempted to claim. In addition, we are not aware of any specific calculations that adequately uphold this view. In the case of table tennis, or ping-pong, the rotation effects on the ball are clearly visible. In addition to the trajectory deviation that can be observed as the ball travels through the air, the ball also possesses intrinsic rotation, and as it bounces off the table deviations can be clearly seen in its trajectory due to this rotation of the ball and its light weight. If it becomes zero, the forces of friction disappear and the movement becomes a rolling movement (free from skidding) V = r w, the direction of the roll determined by the angular velocity rather than that of the trajectory. If V < 0 the ball will roll backward (toward the point of impulse), modifying once again the trajectory of its centre of mass. If V ≥ 0 the ball will roll forward, but following the direction of its angular velocity. The golf ball’s tendency to rotate gives rise to potential dynamic instabilities within the ball, causing loss of precision in the strike, a non-rectilinear trajectory and, therefore, a smaller distance travelled by the ball. In the air, the ball’s trajectory according to TDI will also deviate if it carries intrinsic angular momentum, as in this case the torque generated by weight and lift will create the characteristic inertial distribution of spot velocities shown in figure 11.18, whose resulting velocity (see figure 7.3) will be coupled with the linear velocity of the ball’s centre of mass. When the ball collides with the bat, this phenomenon is more clearly evident, as the player has the capability to strike the ball with an effect, causing the ball to acquire a new non-coaxial angular movement, the distribution of velocities generated in the ball due to this new asymmetric impact may couple with the velocity of the ball’s centre of mass to give a new non-rectilinear trajectory. This is the typical table tennis ball effect. In the case of ping-pong balls, this effect of interaction due to its intrinsic rotation is clearly evident thanks to its light weight, which allows trajectory deviations to be more pronounced. The trend in the design of golf clubs is to increase the size of the iron and to displace the weight of the iron toward its perimeter, with the aim of allowing greater precision in golfers’ strikes and causing the ball to travel longer distances. The golf club iron is the part that interacts with the ball as it strikes it and the reasons for increasing its size and redistributing its weight are found in the study of its inertial momentum. In section 7.4.1.
we analysed the Magnus effect and noted that its possible effects on golf balls, liable to modify their trajectory to the extent that is observed, has not been proved through creditable calculations. Let us assume, for the sake of simplicity, that the surface of the iron interacting with the golf ball is flat. On striking the ball, angular momentum is generally transferred to the ball which generates intrinsic rotation of the ball. There are two possible solutions for the above: the first is for the golfer to strike the ball exactly at the centre of gravity of the golf club iron, causing the angular momentum applied from the iron to be nil as the centre of impact is aligned with the centres of mass of both the ball and the club iron. As human error needs to be taken into consideration, some displacement will always exist between these two points causing some degree of angular momentum to appear and hence, a tendency for the ball to rotate. The second solution, easier to implement, consists of increasing the inertial momentum of the iron with respect to the horizontal axis of rotation, thus increasing its resistance to rotation. To achieve the second solution several methods can be used. For instance, by displacing the weight of the iron toward its perimeter, increasing the inertial momentum from the iron with respect to the shaft. Alternatively, by increasing the surface area of the iron that comes into contact with the ball, which in turn increases the inertial momentum of the club iron. However, there are limits to how far the surface area or the weight of the irons can be increased, since if these are too large the golf club becomes unwieldy and strike precision is lost. The key lies in increasing the surface area of the iron using materials that are very light but provide the necessary strength. Nevertheless, all the above criteria tend toward clubs that enable greater striking precision without generating rotation of the ball given that, as we have said, it is this rotation that would enable deviation from the rectilinear trajectory as the resulting distribution of velocities generated by the intrinsic rotation becomes coupled with the linear velocity of the ball’s centre of mass. Initially, golfers believed that any type of rotation in the ball was detrimental. However, in 1877 the British scientist P. G. Tait discovered that a ball that is given ‘backspin’ (rotation in the form of a backwards spin when a player strikes the golf-ball) actually travelled a greater distance and may benefit from extra lift. 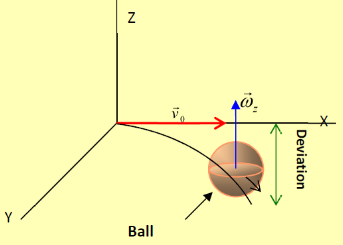 Explanation of ball effects on a non-rectilinear trajectory: hook and slice shots are today attributed to the way the golf ball rotates. If on being struck the ball spins clockwise (to the right) on its vertical axis, its trajectory will deviate to the right. If the ball spins anti-clockwise (to the left) on its vertical axis, the ball will deviate to the left. Both criteria coincide with the Theory of Dynamic Interactions. In our opinion, by means of TDI the strange and sometime absurd behavior of golf balls can be fully justified. 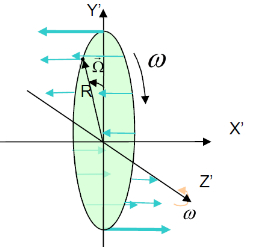 Figure 11.19 shows the distribution of non-homogeneous accelerations in a cross-section of a ball generated by the non-homogeneous distribution illustrated in figure 11.18, where the ball is subject to a new rotation on its horizontal axis, non-coaxial with the existing rotation. This field of accelerations can be identified as a field of forces acting on the ball, modifying its trajectory. Barceló, G.: A Rotating World, Page 377 and following. Ed. Marcombo: Barcelona, 2008. Barceló, G.: A Rotating World, Page 379 and following. Ed. Marcombo: Barcelona, 2008. Barceló, G.: The flight of the boomerang. Page167. Ed. Marcombo: Barcelona, 2006. Barceló, G.: A Rotating World, Pages 381-382. Ed. Marcombo: Barcelona, 2008.